I recognise the logo as Mitsumi. Edit: Knowing the manufacturer, I found it quickly in the Wiki listed as "Mitsumi simplified" but Mitsumi themselves probably called it "KDM". Great! Thanks! Here I was searching "EWE"
I followed a hunch into the Wiki: It looks like a variation of the Chicony 5150/5160. The Wiki lists a few of them on different articles (that perhaps should be merged): Chicony 5160, SKB-5150C, Tai-Hao TH-5150. The switches should be mechanical, but (as usual with Chicony) could be one of a myriad of different switches. 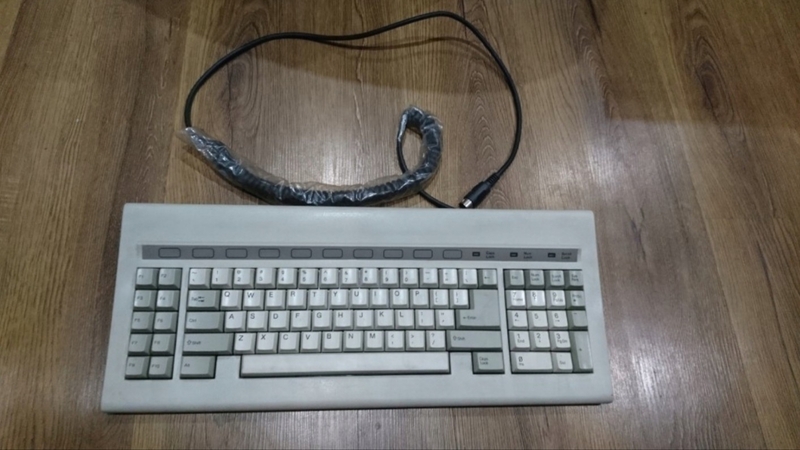 Could be Cherry MX or Alps, Omron, Futaba, Mitsumi, a clone of Cherry MX or something rarer. Last edited by Findecanor on 02 Apr 2019, 22:30, edited 1 time in total. That or a Focus FK-727/747. Pretty sure it's not the Chicony though. Yes it is 727 or 747. Somebody on discord help me. Alps Blue version never used. But thank a lot for help. Here is a photo of one, earlier in the thread. I retract my statement about them probably being the same OEM. Anyone have an idea on this big block of black. It has a 5pin din connector and no label at all. Has a funky line design on the back that I’ve never seen before. Is it some sort of cherry board? Early generic LCD luggable. The slots latched it to the front of the case for transporting. And that's why the pattern is there - it was visible when closed and latched. Probably 286/386 vintage, most likely white Alps, but that's just a guess based on the others I've seen. Probably 286/386 vintage, most likely white Alps, but that's just a guess based on the others I've seen. The earliest Dolch were these keyboards too, and those were Cherry MX Blue. Thanks, so much knowledge! Keep on sharing and have a great day! So you're the one that ended up getting that! I have never seen the switches either, I was going to do my best to document them. I've not a clue on the keyboard except that it's likely made by Deyi Technologies based on the FCC ID. Could you please be so kind as to disassemble the keyboard and take pictures of the PCB? And if you could go a step farther and desolder a switch for documentation that would be seriously appreciated. I bought one of those brand new for the Alps-mount, Tai Hao doubleshot keycaps. Mine had exponentially-stiff "linears" that were just horrid on every level. They were like Cherry MYs but without the solidness. They are extremely rattly. The keycaps look like they were made by Chicony/Montery. So it's either a rubberdome, or alps mount switches. The shape and font used on Chicony's alps mount caps are very distinctive. The clicky version seems ok, in a bad movie sort of way. Of course I won't know till I use it for an extended period. It was easily the worst switch I've ever tried. It honestly made an average office keyboard seem super premium in comparison. Not sure about the clicky version though. Can anyone identify this for me? I sifted through the wiki sections for NTC, Tai-Hao and Datacomp boards but couldn't find an exact match. Thanks!